Each beautiful Darphin formula is the product of impeccable botanical ingredients, innovative technology and sensorial techniques, which give your complexion a signature healthy lustre. Looking to find out a little more about the superstar skincare brand? 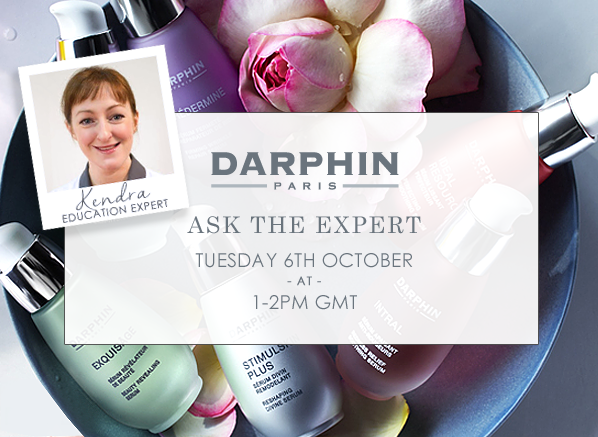 Darphin’s Education Executive, Kendra, is on hand this Tuesday from 1-2pm to answer all of your questions. If you can’t make that time, simply leave your question below! This entry was posted on Friday, October 2nd, 2015 at 3:30 pm and is filed under Skincare, Special Post. You can follow any responses to this entry through the RSS 2.0 feed. Both comments and pings are currently closed.